The documentary Cancer: The Emperor of All Maladies, about to air on PBS on March 30, not only chronicles the history of cancer care but also offers a glimpse into its future. In this short video, two Memorial Sloan Kettering researchers share their insights into the next wave of cancer science. Joan Massagué, Director of the Sloan Kettering Institute, describes how the field of cancer science is evolving into an increasingly multidisciplinary pursuit, with researchers collaborating across disciplines such as biology, biochemistry, genetics, mathematics, physics, and many more. This cross-pollination of perspectives has allowed the latest generation of researchers to transition their focus from smaller aspects of biology toward bigger questions about normal physiology, embryo development, or tumor development — which, in turn, can make a broader impact on the field. Adrienne Boire, a neuro-oncologist and member of Dr. Massagué’s lab, highlights as well the role of new technology in transforming the way researchers carry out their work, singling out bioinformatics in particular. 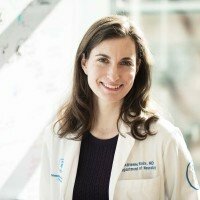 She echoes Dr. Massagué’s enthusiasm for the laboratory environment at MSK, emphasizing the thrill of scientific discovery and the incredible value she finds in her colleagues’ diverse viewpoints.